- Use the exhaust fan every time you shower, and if your bathroom isn’t equipped with one, crack the window to allow the steam to escape. - Wipe down the shower walls and door when you’re finished, leaving the door open until everything is completely dry. - If you use a shower curtain, use an anti-mold spray, commercial or homemade, to spray the curtain down, and pull the curtain to its fullest length to dry. - Any leaks should be repaired immediately and inspect under the sink every few weeks to make sure everything is dry in the cabinets. - If you have a tile bath, give the grout a waterproof seal once a year. - When you do find mold on hard surfaces, the CDC recommends mixing a solution of no more than 1 cup of household bleach in a gallon of water. Provide good ventilation, spray on affected areas, leave for five minutes, rinse, and allow to dry. - Use washable mats and throw-rugs with waterproof backing at doorways. - Keep your home’s humidity below 40%. Using a humidifier is a necessity in Winter, and you may need to use a hygrometer to help you keep moisture levels in check. - Occasionally inspect your fridge’s drip pan for excessive moisture, and clean according to manufacturer’s instructions. - Attics can be the first-place mold can start in case of a leaky roof, so get the roof repaired immediately, and clean the mold as soon as you discover it. Be sure there are no leaves or other obstructions blocking the attic’s vents. - Having the crawl space of your home encapsulated can be expensive, but it is the only solution to keeping moisture from coming up from the ground and can help you see standing water in case of plumbing leaks. 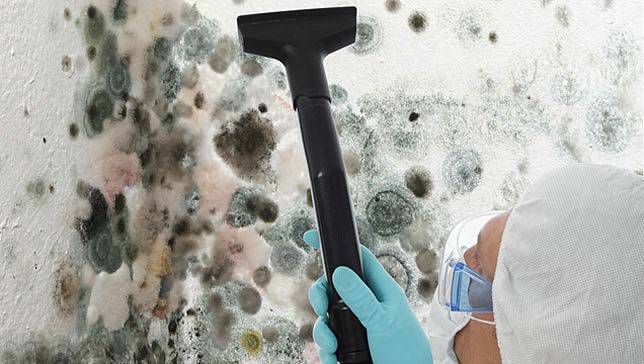 - The EPA has some tips for mold cleanup, as well as information on when to call in a pro for removal.